Spray bottle, Pressure can or Backpack sprayer, Spray boom and Fire hose sprayer. From Concentrate: Dilution Ratio: 1:5 parts product to water, up to 1:10. De-OIL-IT has no flashpoint. Can be applied to a hot engine. Cover any exposed electrical components with a plastic bag or plastic wrap. This will prevent the electrical components of the boat from being exposed to water which will be needed. Cover the breather or air intake and carburetor on older engines with heavy aluminum foil or plastic. You may choose to tape or tie this in place, since water can cause serious problems if allowed into this area. Spray engine liberally with DE-OIL-IT. Agitate heavier grease build ups with a stiff bristle brush for quicker results. Allow 15 -30 minutes for DE-OIL-IT to fully penetrate the oil build-ups. DE-OIL-IT is water activated. When the treated area dries, the solids in DE-OIL-IT stop working and remain dormant until they are rehydrated. 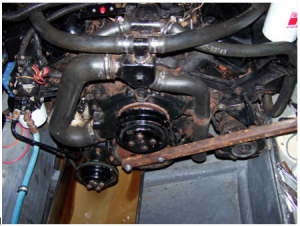 Thoroughly rinse engine and all areas in the engine compartment and even on painted surfaces outside the engine compartment that may have gotten some over spray. For inboard engines, allow runoff water into bilge for bilge for bilge cleaning. May require 2nd treatment for severely dirty engines. When targeting heavier build-ups and oily areas with spot spray applications, do not rinse directly afterwards. 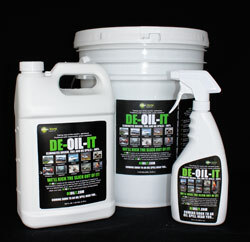 DE-OIL-IT will continue to break down any remaining grease and oil deposits from the engine for days after treatment. Greasy Inboard engine ready to be DE-OIL-ED. All rinse water can be flushed into the bilge. Cautions: Keep Product away from children. Skin Contact: protective rubber gloves not required but recommended; rinse thoroughly with water until any irritation subsides; application of skin or hand moisturizer recommended after use; if irritation persists seek medical assistance. Not for use on glass. De-Oil-It is specially formulated to be extremely effective and safe for marine environments since De-Oil-It breaks down and detoxify’s** the hydrocarbon contamination (oil, grease, and fuel spills) thereby being a very environmentally responsible product to clean you boat, boat engine and bilge… please be responsible regarding regulations, etc. regarding using this product (and other cleaners for that matter) in our waterways. Note: De-Oil-It eliminates the flash point of oil, grease and fuel spills making the product a natural fire extinguisher, and much easier to clean up after a fire emergency in comparison to detergents, foams and grit material to cover (decreasing oxygen) + mop up. Your application and disposal of De-Oil-It cleaning may be affected by government regulations. ** Detoxification / non-toxic means an end result correctly applying De-Oil-It by following the recommended dilution guide, availability of water and oxygen (the activators of De-Oil-It), and being patient (in time naturally occurring bacteria in land and sea will enable the degrading of the hydrocarbon contaminant into smaller simpler molecules of carbon, hydrogen and oxygen versus a complex fully attached hydrocarbon molecular chain that is toxic). Detergents and solvents can only partially breakdown the hydrocarbon chain and their degrading action is weak in the sense that the separated simple hydrocarbon molecules re-bind, leaving remnants of toxic compounds that are harder if not impervious to natural bacteria final degrading; one consequence of this is to encapsulate the oil making it heavy and sink to the ocean floor. De-OilIt’s “colloidal miscelle” technology more successfully breaks down the complex hydrocarbon chain, separates smaller simpler hydrocarbon elements, and De-Oil-It then more tightly binds to the broken down hydrocarbon chain parts so they do not reform as is the case with detergents and solvents. 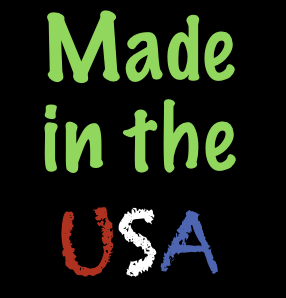 We are a non-detergent, non-solvent, organic only formula that works. We are here to help you understand remediation methods including how much agitation, working with soil and sea, as we have a wealth of experience regarding successful approaches and final outcomes.